The false widow: 'will not jump at you from a web'. GETTING A DAY off school: good. Getting a day off school because your school is infested with venomous spiders: awful. The Dean Academy, a secondary school in Gloucestershire, closed yesterday to get rid of an infestation of false widow spiders. The spiders – which are becoming increasing common in Ireland and Britain – are often mistaken for their sometimes-deadly relative, the black widow. The school said no one has been bitten by the spider but local health authorities had advised it to close for the day to deal with the infestation. Experts say the Steodata nobilis, a species of the false widow, are becoming more common in this part of the world. 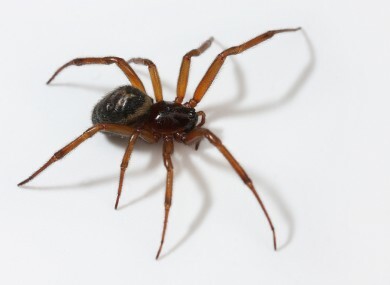 Arachnologist Myles Nolan recently told RTÉ Radio One’s Mooney Show that “there’s a massive population of both of these false widow spiders all over Dublin as this stage”. He added that they won’t be “leaping at people from webs” or anything like that, and in most cases the symptoms are mild. The spider’s bite may sting, swell up or cause discomfort like a wasp sting, but has not been known to cause deaths. “They’re not aggressive spiders, they don’t seek out humans,” said David Lalloo, a professor at the Liverpool School of Tropical Medicine. “Most people won’t get much of a reaction. Some people may feel a bit unwell for a day or two, but that’s very rare,” he said. Email “UK school forced to close after becoming infested with venomous spiders”. Feedback on “UK school forced to close after becoming infested with venomous spiders”.